EL MUNDO has learned that among the papers that will be submitted to the Audiencia Nacional there is information which documents, in a direct manner, that the military chief at the U.S. Embassy in El Salvador, Col. Milton Menjivar, and a senior U.S. State Department official knew what the Salvadoran military high command was planning against the rector of the UCA. 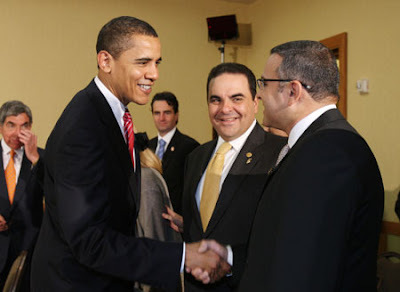 In 2009, both Mauricio Funes and Barack Obama assumed power following presidential campaigns featuring themes of hope and change. Now the two presidents face similar challenges, challenges which make it difficult to meet the high expectations their campaigns created. Both Funes and Obama are waging wars which they inherited from previous administrations. Obama has the wars in Afghanistan and Iraq, where he is currently deciding how many thousands of additional US troops to send into the area. Funes has the war against criminal violence and murders, where he has recently made the decision to send thousands more troops into the streets in high crime areas. Dave's Landslide Blog has shown where you can now see satellite images showing the paths of landslides and flooding on the slopes of the San Vicente volcano. The images show the paths of landslides by showing where vegetative cover was ripped away by the cascade of mud down the slopes. Speculation about such political machinations increased last month when 12 Arena congressmen announced a break from their party. Calling themselves "independents," they proceeded to vote with the FMLN against an investigation Arena wanted into abuses of agricultural subsidies. An arbitration case brought by Pacific Rim Mining against the government of El Salvador will move ahead, as the arbitration tribunal has now been constituted, the company reported on Thursday. Pacific Rim embarked on arbitration proceedings because of the government's failure to issue permits for the company's El Dorado project, three years after Pacific Rim submitted a mine design to authorities. The company claims the government has breached international and Salvadoran law in its “improper failure to finalize the permitting process as it is required to do and to respect the company's and the enterprises' legal rights to develop mining activities in El Salvador”. So far this year, there have been 3,673 murders in this country of 5.8 million people - 494 more than in the same period in 2008, according to police statistics. The novel aspect of the measure is that soldiers will now be allowed to carry out searches and arrest people, and to set up checkpoints on the roads - something that hadn't been seen since the 1980-1992 civil war, in which 80,000 people - most of them civilians - were killed, mainly by government troops and far-right paramilitaries. "The armed forces will be able to search houses, frisk people, set up checkpoints, and arrest people caught red-handed," said Funes. Today is the 5th anniversary of the start of Tim's El Salvador Blog. I'm in El Salvador as I write this post, having just participated in the commemorations of the murder of the Jesuits and the subversive cross. I'm also here to understand more of the country's needs following the floods of a week ago. in the Lutheran Church of the Resurrection. the Bishop who pastors the church. No es la cruz de la muerte, he says. It’s not the cross of death. is for the Church, maybe for the library. He says he’s a refugee himself. He says we’re all beggars. Lawyer's Committee on Human Rights Report: The Jesuit Case, September 1991. Website -- Center for Justice and Accountability -- currently prosecuting Jesuit case in court in Spain. 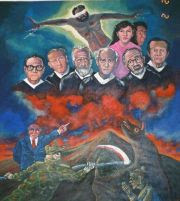 Website -- Enemies of War, a PBS documentary about the Jesuit murders and their aftermath. In a nationally broadcast address Sunday night, Funes said "the drama we are experiencing is the product of the precarious conditions in large swathes of the country due to the lack of buffer zones and risk prevention efforts, which have been demanded for years but were never made," said Funes, referring to 20 years of government by the right-wing Nationalist Republican Alliance (ARENA). Funes, who took office in June, is the first leftist president in the history of El Salvador. This video from El Faro makes a statement more powerful than words of the sorrow, two days after devastating floods and mudslides hit the central and south central regions of El Salvador. At least 10,000 Salvadorans are in urgent need of food aid after floods and mudslides destroyed huge swaths of crops during harvest season, the U.N. World Food Program said Tuesday. The WFP is helping feed 500 people in shelters in San Vicente, one of the worst-hit provinces, the U.N. agency said in a statement. But it said thousands more would need help in the coming days. The death toll from yesterday's floods and mudslides rose to more than 130 as more bodies were found and more inaccessible areas were reached by authorities, and more than 90 are still missing. At least 1500 houses were destroyed and some 10,000 forced from their homes. President Funes has declared a national state of emergency and declared that the damages in El Salvador are incalculable. He has called for help from neighboring countries and is seeking to use some funds designated for dealing with the economic crisis to be used for the present crisis. Five departments most affected by rains and flooding, put on orange alert by Salvadoran authorities. The death toll has risen to at least 100 according to EDH. That would make this the worst natural disaster in El Salvador since Hurricane Stan in 2005. 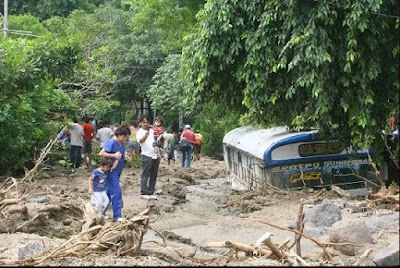 Some of the worst mudslides are reported in the town of Verapaz located in the folds of the San Vicente Volcano, also known as Chichontepec volcano. As 14 inches of rain fell on the area, water and mud came pouring down the sides of the volcano. According to El Diario de Hoy, there has been an 8 kilometer long landslide and entire neighborhoods are under the earth. Also in that vicinty, the river Acahualpa swept away some 30 houses from the communities Dos Puentes and La Caridad (also known as El Zope). In the department of San Vicente as of 1:00 pm Sunday, November 8, there were reported 25 deaths and 40 missing. Torrential rains in El Salvador triggered flooding and mudslides that left at least 91 people dead across the Central American nation, officials said today. At least 60 people were reported missing, and authorities warned that the toll could rise as rescuers reached hard-hit zones that remained cut off by floodwaters and landslides. About 7,000 people were evacuated and scores were plucked from flood zones by helicopter, Interior Minister Humberto Centeno said. Yesterday I described the determination of El Salvador's president Mauricio Funes to make an act of public atonement on the 20th anniversary of the murder of the six Jesuits in 1989. Today, in an equally significant departure from the policies of the past ARENA governments, El Salvador announced that it would investigate the 1980 assassination of archbishop Oscar Romero, determine culpability, and make reparations. SAN SALVADOR — El Salvador's president says the country will award its highest honor to six Jesuit priests murdered by the army in 1989. President Mauricio Funes says the National Order of Jose Matias Delgado awards are a "public act of atonement" for mistakes by past governments. They will be presented on Nov. 16 to mark the date 20 years ago when soldiers killed Spanish-born university rector Ignacio Ellacuria, five other Jesuits, a housekeeper and her daughter. The killings sparked international outrage and tarnished the image of U.S. anti-communism efforts after it was found that some of the soldiers involved received training at Fort Benning, Georgia. SAN SALVADOR – The number of murders in El Salvador between January 1 and November 1 stands at 3,673, more than in all of 2008 and 40 percent more than during the same period last year, the press reported Tuesday, citing official statistics. La Prensa Grafica newspaper based the figure on data from the National Police, the Attorney General’s Office and the medical examiner’s office. The number of murders, which average 13.9 per day, is 40.2 percent higher than the 2,620 homicides that were tallied during the same period in 2008. The National Police added that during last month alone there were 431 murders, 158 more than in October 2008. Authorities warn that nearly two-thirds of the 3,184 men killed this year were between the ages of 18 and 30. El Salvador sneaks up on you: in lefty lounge bars in San Salvador, at sobering war memorials and musums, and along lush cloud-forest trails; it's a place of remarkable warmth and intelligence, made all the more appealing for being so unexpected....Ane when it comes to cities, none in Central America is smarter or cooler than San Salvador, with first-rate universities, museums and galleries, a vibrant bar and live-music scene, and an array of progressive NGOs, both local and international. The number one country in the list was New Zealand. The other countries named in Lonely Planet's top 10 were Germany, Greece, Malaysia, Morocco, Nepal, Portugal, Suriname, and the USA.